In this DIY Step by Step Text Instructions we are going to show you, how to make your own Stretch ceiling or 3D Illusion Roof stretch Roof yourself, with an Easy Assembling Stretch roof Kit from electric-junkys. Easy Installation, Affordable Price, Top Quality Spare parts and Service. Fetch profile Fixation System we offer several Fixation Systems Affordable Robust and Stable! Second Layer or Fixation for Lightning depend on your Wanted Lightning Area. LED System WIFI or Simple with RGB Controller and Remote for sure ! There are a Ton of Options to make an Lightning system under your Translucent Stretch Roof ..
they’re modified for our project you can change the accessories like color of the PVC Ceiling Fabric or the Fixation Profiles, LED Supplies waterproof or non-Waterproof of the led strip IP65/IP68/and more, for this project we use an LED WW/CW and RGB LED System with an Ordinary Music controller which Light up to the beat of the Music the Kit is available on our shop.elektric-junkys.com. There is of course a Possibility of WS2811/WS2812b or WS2801/WS2802 to control several Areas in a Disco Bar or Club. 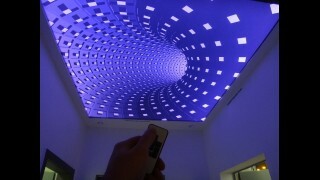 We are using here a PVC Stretch Ceiling robust, easy installation and Fitting, awesome look. BE SAFE ! IF YOU ARE NOT SURE WHAT OR HOW TO DO CONTACT AN PROFFESSIONAL! Don´t hurt yourself or others with actions caused by Unauthorized Machine Usage ! we take no responsibility´s for the here showen Instructions. THIS PROJECT IS FOR ENTERTAINMENT AND ADVERTISING PURPOSES ONLY! Be sure that the BASE of the Roof is Stable and in the Conditions to install your Roof, be sure that the Roof is not completely instable that later nothing can Fall on your Stretch Ceiling. As you can see we were adding an suspended ceiling by plasterboard Plates, to come on our Requested Size of the Roof.. for Future orders please be sure that you are ordering 30mm more on each side for stretch the PVC Later..
Once we created our Frame plasterboard Roof, we are going to ad our Aluminum Fixations, Cut them on your needed Lengths. Drill the Screw holes in the Profile before if you have no Self Drilling screws. Fix your Alum. Profiles on the Roof construction be careful and take care that they are Well aligned and also in Spirit Level. 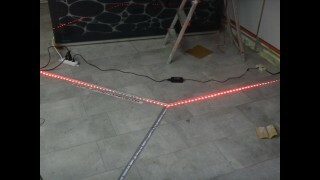 Assemble the LED Supply, Use the Double Sided Tape on the LED Strips, peel the protection paper from it, place the LED Strips aligned your Pre added Fixation Profile for the LED Source. After you placed it take care that the Power is enough on every Side of the Roof, you may split the Power and Input a Fresh Power Cable from your Power supply to the 4th Meter of every Strip. Unfold your Stretch Ceiling Fabric you receive of us, we fold it in a Special Way that there are as less as Possible Folds .. We will get them out anyway but more to that later.. So unfold the Fabric on a CLEAN Floor with enough Space. Close all your Doors and Windows, Start Your Heat Blower to Heat up the Room on about 40 degree Celsius. ! - Make sure to not forget any Tools or other stuff on you roof..! 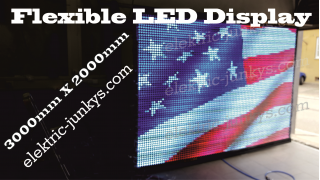 - Make Sure the LED System is well secured and no Cables are hanging loose around.. ! Now you can Use your Big Fan Heater to heat up the Fabric, blow on the Fabric with an distance of at least 1.5 - 2meters based on Thickness of the Material and the Room air Conditions NOT TOO LONG ON ONE POSSITION!! EVELY MOVEMENTS Heat up the ceiling until you see the Folds are disappearing and the Fabric is soft and smooth. WARNING DO NOT APPLY HEAT AT ONLY A CERTAIN POINT OR YOU WILL BURN THE FABRIC AND THAT’S IT, ALL WARRANTY CLAIMS WILL BE REJECTED! Now directly “after heat up process” grab the long sides of the Roof and start squeezing them into your Fixation Profiles. If your room is not well isolated the roof will cool down faster and you have to heat it up again ;) ! THE CEILING FABRIC NEEDS TO BE SMOOTHLY AND SOFT TO PROCESS IT ! Use your Hand Heat Gun to remove all remaining Folds.. ATTENTION AGAIN - DO NOT APPLY TOO MUCH HEAT TO ONE PARTICULAR POINT OF THE FABRIC!!! UNIFORM MOVEMENTS!!! So I Say Cheers ….